Despite still being disappointed by the manner of his side’s Irish Cup exit, Institute boss Kevin Deery wants his players to finish the season strongly. The Drumahoe men entertain Knockbreda this Saturday (KO 3pm) in the final game before the ‘split’ and Deery is looking to start building momentum as the business end of the campaign closes in. There are 33 points still to be played for until the end of the season, so there’s still a lot of football to go but we feel we need to get off to a good start with a number of wins. “Yeah, I’m still disappointed and annoyed about the Linfield game,” he admitted. 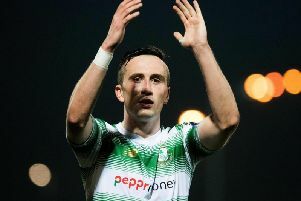 “We have lost back to back games in the league, so we feel that we need to get a win against Knockbreda and then get set-up for the split,” he stated. “We feel now that we have had our wee dip in form, which happens to a lot of teams so my thinking now is win this game at the weekend, which will probably mean we’ll finish third before the split and then you’ll have a good idea of your fixtures. There are still 11 league games remaining and Deery feels there will be more twists and turns for the remainder of the season. “There are 33 points still to be played for until the end of the season, so there’s still a lot of football to go but we feel we need to get off to a good start with a number of wins,” he added. The Waterside men, who lost 2-0 to Finn Harps in a friendly on Tuesday night, will be without midfielder Aaron Harkin through suspension, Dean Curry misses out with a stomach muscle problem, but recent signing from Dergview, Kyle Friel-Curran, is in line to make his competitive debut, having played aginst Harps last night. “Dean will probably be another week or two,” added Deery. “It has been a bit stop-start for him and when he comes back he’ll need a week to 10 days just to get fit again, so that he can perform at his best level.